Live rocks are natural rocks, collected in tropical seas, and used in reef aquariums to bring live elements, micro organisms and bacteria necessary to life in aquariums. Quality of wild live rocks often varies, depending on their origin and for the same origin, depending on maintenance and transport conditions. These live rocks can give very different results once in your aquarium; it’s like a lottery, with winners and losers. Some eminent specialists consider that above all, the quality of the porous structure of the rocks is important for long term efficiency. That’s why we developed the porosity of our aquaroche rocks (ceramic rocks and eco reef plates) and managed to create products with an important open porosity in the heart of the rocks, similar to porosity of the best live rocks. Our methods of production grant a regular and reproducible quality of the rocks. Comparison of porosity of live rocks. New, they can be used as a “seed-able” structure for the décor, together with live rocks which will bring the biological part. Last step, these artificial rocks are now available as “live rocks”, produced by partners with specific methods. These seeded rocks have become real live rocks, acclimated and granting a good result. Report on production of artificial live rocks. Our rocks for aquaculture of live rocks. Being concerned with protection of natural resources, we chose to propose specific rocks for production of artificial live rocks. Eco reef plates are flat rocks, with anaerobic structure in the heart. They can be integrated (new or colonised) directly in our reef system elements. Ceramic rocks are more irregular in shapes, with cavities and fissures where micro-fauna and micro-organisms can shelter. They make it easy to build stable, strong and aesthetic decors. These same rocks can also be colonised by aquarists in their own aquariums, together with a proportion of live rocks to start the process of colonisation. Quality of result will of course depend on quality and diversity of micro organisms of the initial milieu. 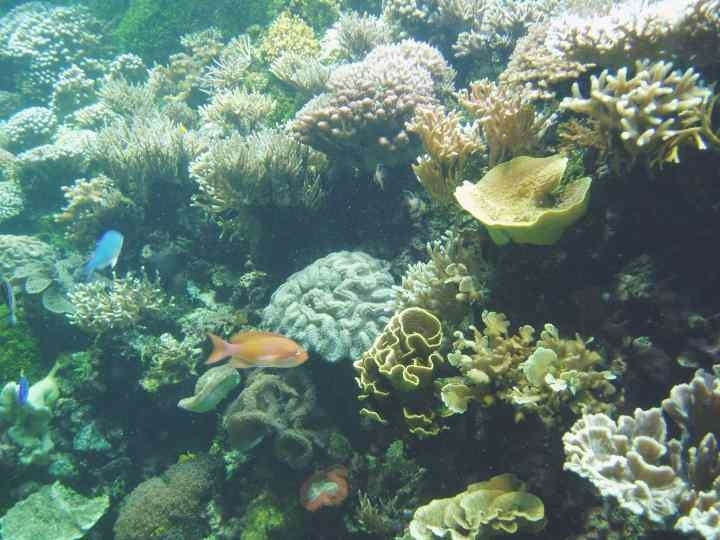 With cultured live rocks, we protect the environment with less and, in the end, no depletion of the coral reefs, less plane transport and less road transport for final delivery. Conditions of colonisation in active bacteria and algae. New, aquaroche rocks are sterile. Thanks to their open porous structure, our rocks can shelter micro organisms which will develop month after month. Aerobic and anaerobic bacteria will find there a propitious milieu and rocks will become a biological reactor similar to live rocks. Colonization can take months if you do not include live elements. 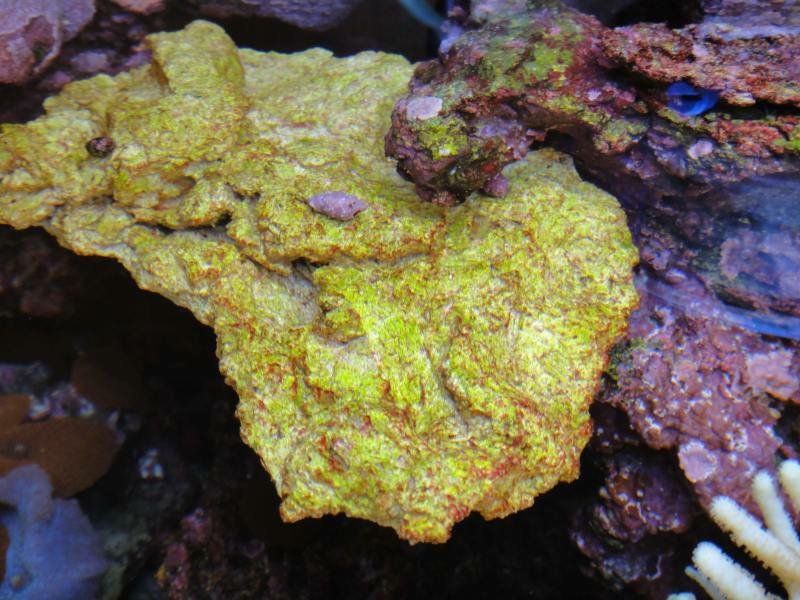 The simplest, for inverts or fish is to include good bacteria with very good live rocks.. A good variety of initial live rocks will colonise the rocks more rapidly, with micro organisms and coralline algae. A strong water circulation, calcium rate over 360 mg / litre, magnesium rate 1300 mg / litre, KH of 9 and a light with blue colour, will contribute to success. Development of bacteria of different origins, brought at the beginning into the rocks, takes approximately 4 weeks to reach a good balance; first you get a nitrites pike and then a progressive reduction. It is difficult to give exact time for different stages of evolution of algae and specifically for coralline algae. Short time (a few weeks) for rocks set up in a mature aquarium and several months in new aquariums. It depends on particular conditions of each aquarium, and on the use of lights at the beginning. 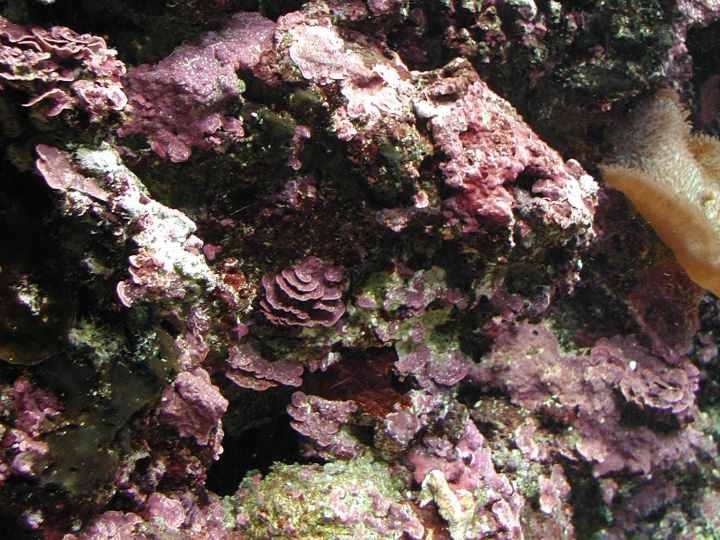 Coralline algae are a great expectation of reef keepers, with the idea that it is a quality of the live rock. In fact a rock without porosity can be covered with coralline algae and be totally inefficient in the nitrogen cycle. What’s important in a Berliner tank is the porosity and the filtration capacity of the rocks; a good development of corals will be the proof of a good functioning of the aquarium; some very nice aquarium have no corallines, some have, it’s difficult to explain. Proportion of new aquaroche / wild or cultured live rocks. The proportion of live rocks to Aquaroche rocks depends on the type of population of the aquarium, the budget and on the attitude of the aquarist to depletion of natural resources.. Considering the good colonisation of the LV aquaroche – live rocks and the money saved on wild live rocks, you should prefer a very good quality rather than quantity of live rocks. For 100 litres water: total of 10 to 20 kg of active rocks. It also depends on the density of the rocks. 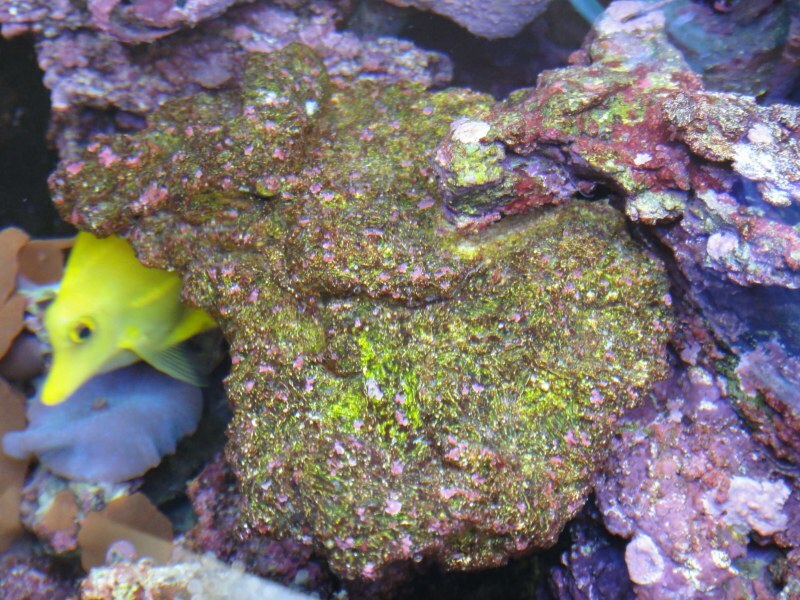 Colonised aquaroches can be twice to three times lighter than wild live rocks (Caribbean) and it’s then difficult to keep the same ratio of 20 % of rocks as the décor would be too big for the volume of the tank. Ratio new Aquaroches and live rocks: The quantity of new or inert rocks can be 30 % up to 90 % of the whole quantity. Comparison – weight / volume. 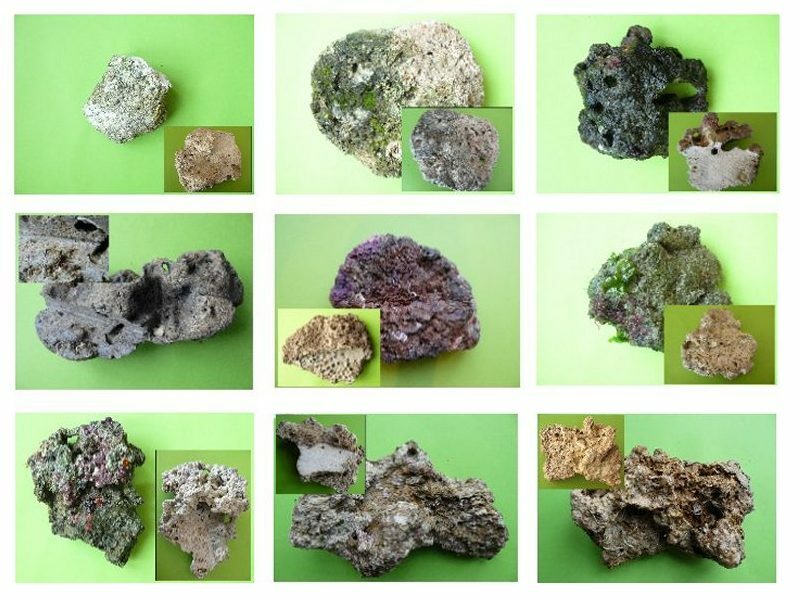 For reef aquariums, comparison of price is often made with the weight of live rocks; If you want to compare aquaroche rocks with live rocks (or live rocks from different origins), you should compare the price / volume. Densities of natural live rocks can be very different. What’s important is the volume of active rocks, not their weight. equivalent to 0.15 gallon for 1 Lb (for the same weight: 1,7 bigger than an Indonesian live rock). An aquaroche eco reef plate (dry) 1,20 litre. equivalent to 0.16 gallon for 1 lb (for the same weight: 1,8 bigger than an Indonesian live rock). Comparison of internal structure and density of live rocks. Many aquariums have been equipped and working for years with our ceramic rocks. 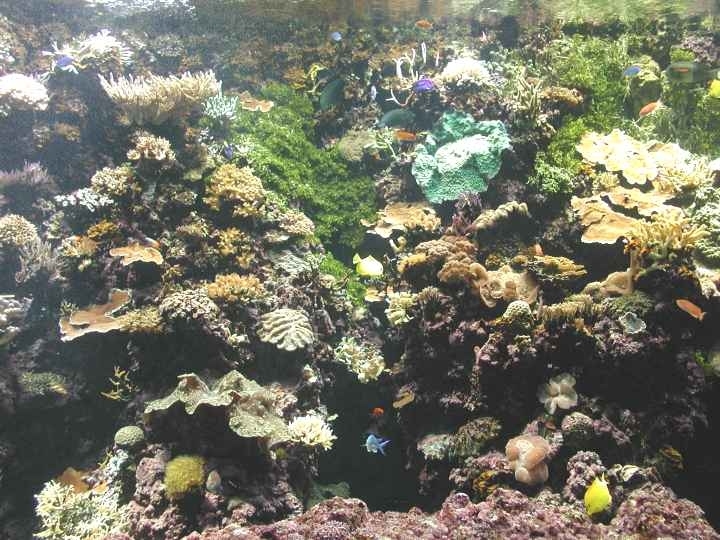 An example that everybody can visit is the great coral tank in Océanopolis in Brest, installed in 2001. You can see the result obtained with 3,5 tons of new aquaroche ceramic rocks and 1,5 tons of wild live rocks. 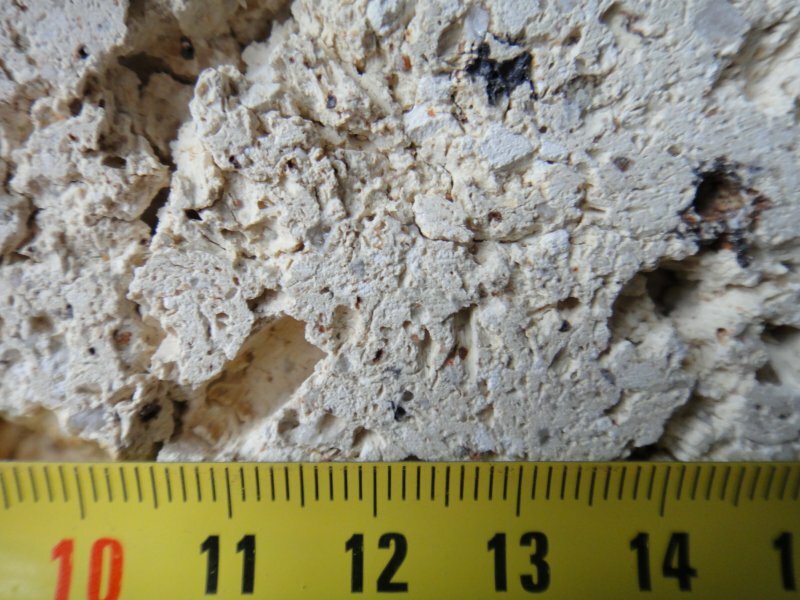 Note that these rocks were the old version and that the porosity has been improved since 2005.